While not a new concept, a new decentralized service is beta testing a peer-to-peer network that would "rent" unused capacity from your computer's hard drive as part of a cloud service to store files from other users. The service, called Storj, uses the network and end-to-end encryption to allow the transfer of data to and from your computer’s drive. Your hard drive is literally used to store other people’s data. During a crowdsourcing campaign last year, Storj garnered 910 Bitcoins valued at $461,802, according to the CoinDesk Bitcoin Price Index. Users who rent out space on their hard drives earn “Storjcoin X” (SJCX), a form of currency that can be used to purchase capacity on Storj's “Driveshare” service. Users earn the SJCXs by selling excess hard drive space with DriveShare, or use it to purchase space on the Storj Metadisk network using the company’s file sharing app. 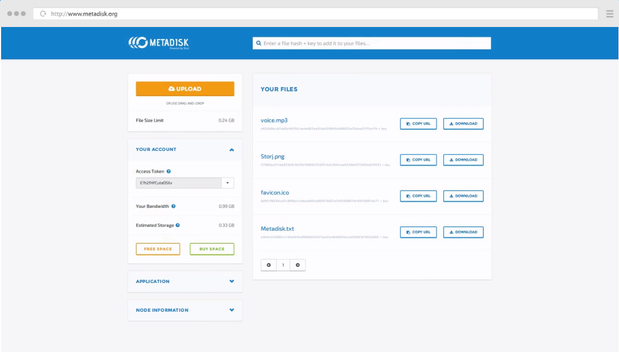 Users who want to store files on the peer-to-peer network simply drag and drop them into the Metadisk app, where they’re then listed for viewing or retrieval. If a user wants to share a file with someone else, they simply click on a “copy URL” icon and send along the resulting URL. The service works by first uploading a file-sharing application onto a user’s computer then breaking file data into small 8MB or 32MB blocks, or “shards,” as Storj calls them. Each block of data is encrypted with a unique hash, and then the pieces are distributed throughout the cloud network, according to a white paper the company published on its peer-to-peer storage technology. The file blocks get distributed throughout the network on nodes called “DriveShares” located all over the world. Storj uses hash chains or Merkle Trees, as they are sometimes called, to verify the contents of a file after it has been broken up into blocks or “leaves” off of a master or root hash. An illustration of how a file is broken into blocks, each assigned a hash, and then distributed throughout a peer-to-peer file sharing network. The master hash, which is stored on a trusted source, is key to retrieving and checking authenticity of all pieces of a file stored in the network. The Merkle Tree with all its leaves, is checked against the trusted master hash, and if the hash tree is damaged or fake, another hash tree from another source will be tried until the program finds one that matches the top hash. Storj periodically cryptographically checks the integrity and availability of a file, and offers direct rewards to those maintaining the file. “Storj plans to support ‘grey-listing’ for files that are known to be of illegal or violent nature, etc. This can be made possible through shard grey-listing. Anyone could make a grey-list indicating the unique hash of a shard that is associated with certain decrypted content,” Storj stated in a blog. “Then, the [user] could decide to [opt-out] to such a grey-list if they don’t wish to be party to distribution of such content (e.g. child exploitation, violent terror videos, etc.). “In absence of a peer-to-peer network, the described methods may be used to allow users to control, migrate, [and] validate their data on 3rd party data providers without the provider having direct access to the data," the company said. While Storj would like to believe its proposed drive-sharing service is unique, even calling it “a new idea," it’s not. Peer-to-peer cloud storage services have been around for years. For example, cloud storage vendor Symform offers unlimited online capacity to customers who pay by contributing local disk capacity to their network instead of money to their coffers. In 2009, when Symform launched its Cooperative Storage Cloud service, it sold mainly to resellers, who paid $15 a month for unlimited capacity and could then offer that pool of capacity to customers as an off-site disaster recovery backup service. Then, in 2011, Symform began targeting small office and home office users as well as small- and medium-sized businesses. The company asks businesses to contribute their storage capacity at a 2:1 ratio in order to receive the service. That means a user must contribute 2GB of space for every 1GB used. The concept behind sharing unused storage capacity through a peer-to-peer network has been around for more than a decade. Back in the early 2000s, the University of California's OceanStore project was based on the concept that information could be broken down into many parts, assigned a unique metadata identification tag, encrypted and then randomly stored on systems throughout the world. MIT has a similar project, called Chord. Symform's cloud storage technology model is similar.